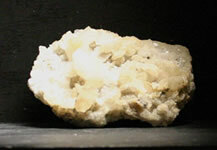 The specimens shown at right are from the Rogerly Mine in England. 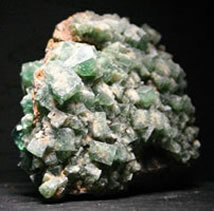 The specimens are fluorite and are sometimes nearly opaque to clear with a green tint in normal light. 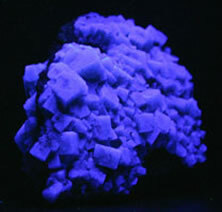 Under long wave ultraviolet light, the specimens in the middle column fluoresce a strong blue. The photos in the far right column show a slightly lighter, but more electric, blue fluorescence under short wave ultraviolet light. These are truly stunning and world class specimens. Specimens from this location are among the best of their species in the world. 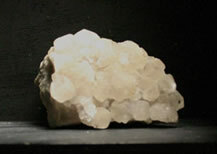 An added bonus of fluorites from this location is that they will phosphoresce for a long while after the lights are turned off in a darkened room. 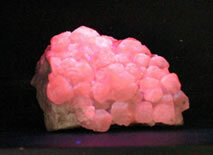 Short wave ultraviolet light is necessary to cause this mineral to phosphoresce. The pink calcites to the right are from Cumbria, England. 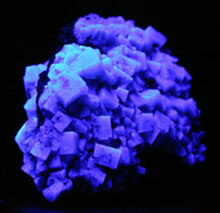 What makes these calcites different from other calcites is that they fluoresce best under mid-wave ultraviolet light. 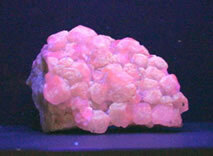 They look like normal calcite under normal lighting conditions. They don't fluoresce under long wave. Under short wave they are a nice delicate pink. Under mid-wave they are a nice orangish pink.